All ATI / Brencor Countersink-Chek Countersink Gages are on sale at Gaging.com! 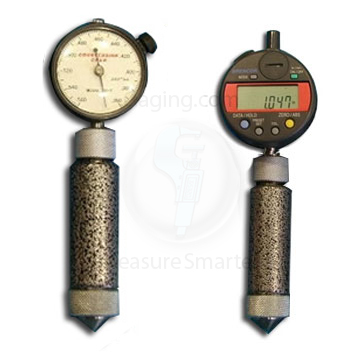 These high quality, "Made in the USA" products are "1 rev", direct reading gages that accurately measure the major diameter of countersink bores. Full-round, exact angle, conical gaging plunger gives readings directly in .002” (.05mm) diameter increments. Available in 82°, 90°, 100°, 110°, 120°, and 130° countersinks and supplied with a setting gage. 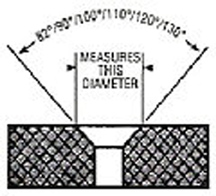 Optional digital or metric indicator available. CS-1782 CS-1790 CS-1710 CS-1711 CS-1712 CS-1713 .020" - .170"
CS-3682 CS-3690 CS-3610 CS-3611 CS-3612 CS-3613 .160" - .360"
CS-5682 CS-5690 CS-5610 CS-5611 CS-5612 CS-5613 .369" - .560"
CS-7882 CS-7890 CS-7810 CS-7811 CS-7812 CS-7813 .560" - .780"
*Actual product may vary from image 90° CS-1790 Brencor Countersink-Chek Countersink Gage .020-.1..
*Actual product may vary from image 90° CS-3690 Brencor Countersink-Chek Countersink Gage .160-.3..
*Actual product may vary from image 90° CS-5690 Brencor Countersink-Chek Countersink Gage .369-.5..
*Actual product may vary from image 90° CS-7890 Brencor Countersink-Chek Countersink Gage .560-.7..